I recently picked up two of the Arcade1Up cabinets since they went on clearance at Wal-Mart (Street Fighter 2 and Pac-Man). I wasn't expecting much due to the lackluster reviews, but I was surprised that it was indeed a very playable experience. Not only that, but it also kinda opened my eyes to the fact that I am getting older, and some of the projects I have wanted to do have sat for years now. My Space Invaders cab is partially rebuilt but is really just a Pi running the game on a TV with buttons wired to the original controls. And the SCI I have I haven't found time to even swap the power supply to see if its the problem, and I have owned it for years. I've been weighing the difference between having the authentic thing versus just paying and getting something close, and honestly, something close is kinda doing the trick. That being said, I sold my SCI and my Space Invaders. Pulled the Pi and sold the Space Invaders to someone doing an actual rebuild, and have a potential buyer for the SCI who will actually restore it and not have it sitting. I am keeping my Magic Sword, as I have put work into it. The original board for it I still have but has a corrupted ROM on it, and I can't bring myself to pay the 150 bucks for the board when I see it for sale, so instead I put in a Pandoras Box 5s in it (which has Magic Sword on it). 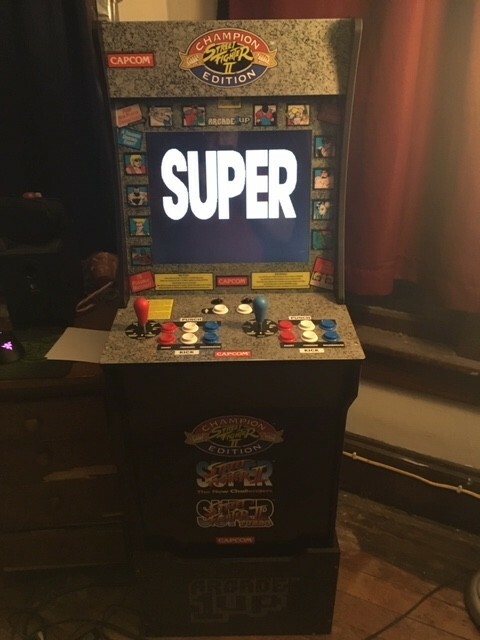 I also added a 3 slot JAMMA switcher and also have a 19 in 1 board and a Wrestlefest board installed, and plan on keeping it as my one authentic cab. Part of me is kinda gutted getting rid of most of my authentic cabs, but the other part loves just switching on and playing on something "close enough" to the real deal. 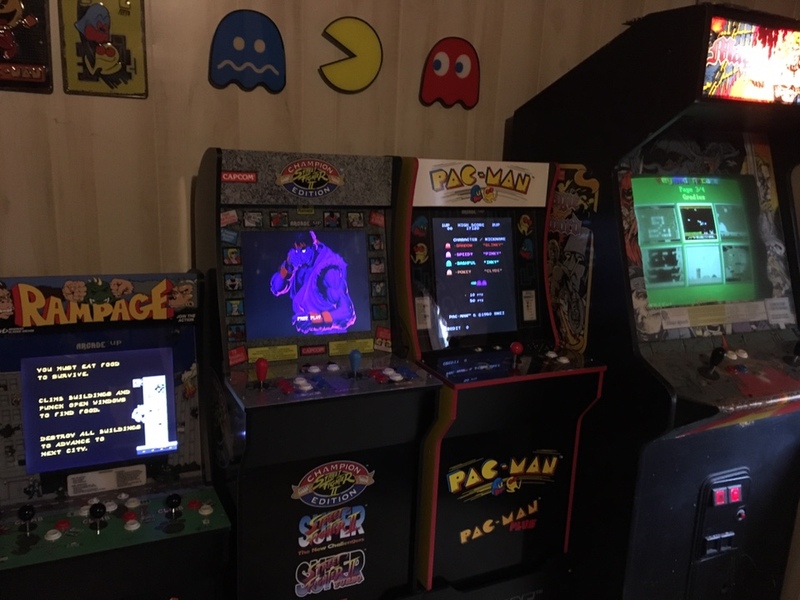 Plus me and my friends have already gotten more enjoyment out of Street Fighter and Pac-Man than we have the SCI that I never got around to fixing, and honestly even more than the emulated Space Invaders, which we can still play on my X-Arcade that I added a Pi to. 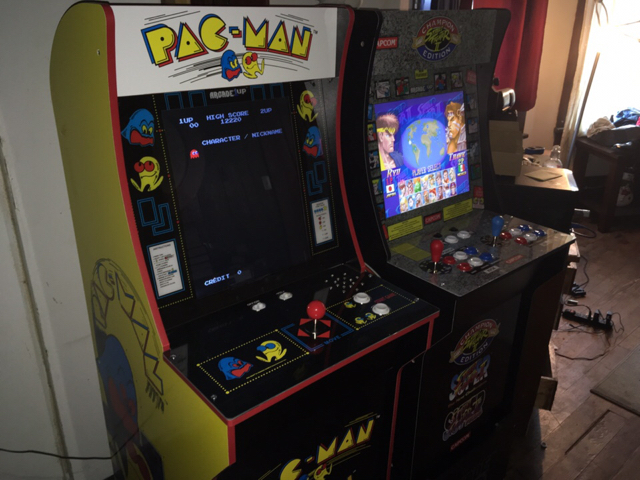 The wife is also thrilled because she thinks the Arcade1Up machines look better (have a cleaner look, plus a more uniform look along the wall) and the way she sees it would rather have working equipment in the game room than nonworking projects I never get to. Another change I plan on making is adding a projector in the room. I have a large CRT I am keeping, but we think we are gonna add a projector to the ceiling with a pull down screen on the opposite wall and also use the game room for movie nights. This also gives me the excuse to take a Pi setup and add to the projector with bluetooth controllers for some big screen gaming. Finally, I am also selling the vending machines I have, as they added to the flavor of the room but really take up a ton of space that could be used for more games, and that flavor can be re-added just by having some signs or posters up on the wall (which I have started buying). Part of me is kinda bummed, but the other part is looking forward to a more streamlined game room. I'll post a few, keep in mind the entire back room is an "under construction" section of the house so it's nowhere near complete. This one is of the new Arcade1Up Street Fighter with a riser. Skinnier than a standard cab, so I can cram more cabs in a smaller area. This is actually in my living room beside my desk until the other cabs are picked up. 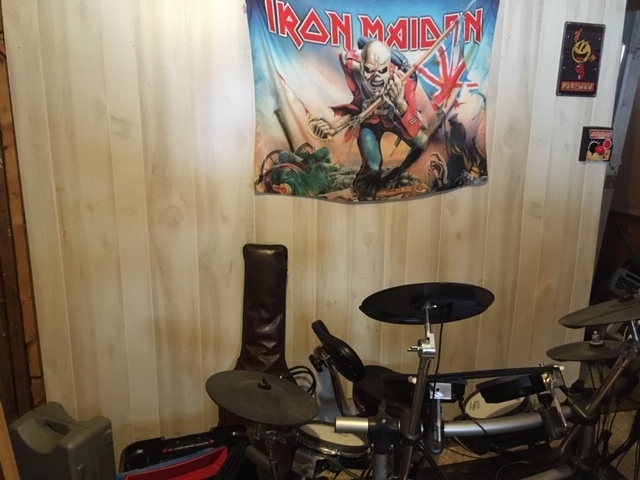 This is the rear wall where the drumset is set up at. Light switch is the arcade stick mounted to the wall, it tips up and down to toggle the lights. The empty side of the wall I have purchased some backlit Pac-Man sprite signs that I have not set up yet, they are lit using USB. 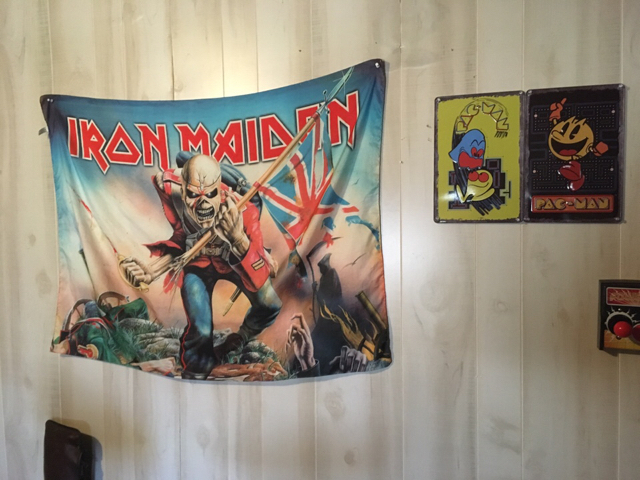 The plan is to set the projector screen above the Iron Maiden flag and pull it down over it during projector use. 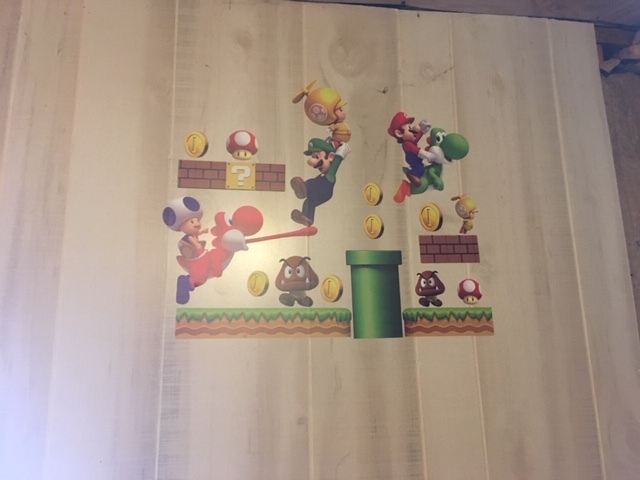 This was actually a gift from my kids, I spent some time with them assembling the stickers into a Mario stage montage that I think turned out really well. 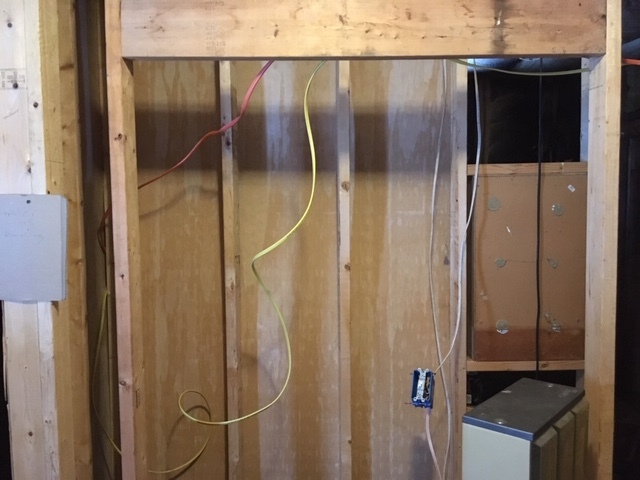 If you look a bit further over, you will see a section of wall I still need to panel. Finally, this wall shows the two machines that will be leaving and the one I will be keeping. This wall will actually open up a bit, as all the machines will be relocated 90 degrees to the other wall, with this one being used as more shelving for gaming related books, my DnD book collection, and a few posters. Also notice the ceiling being bare board right now, have not finished putting in tiling yet. Last edited by Leathco; 12-01-19 at 08:34. Few minor updates. Some people interested in the Space Invaders, no one on the SCI yet. Made a little headway over the past couple weeks. Snagged a Pac Man Arcade1Up like I mentioned earlier. Finally got a riser for it and assembled it. I like how these kinda have a uniform look. 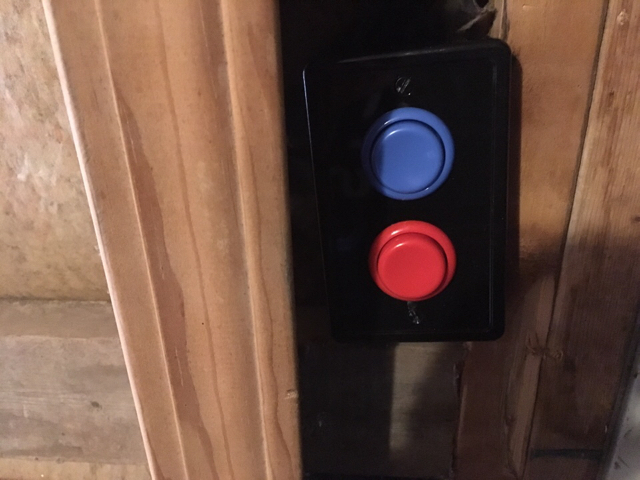 This switch powers the outside flood lights, but it is also inside the game room. The other arcade style switch I got years ago now costs 50 bucks or so and isn’t made anymore, so I went with a couple arcade buttons that trigger a rocker switch underneath. Still gotta put the paneling back up, but I like the look of the switch. 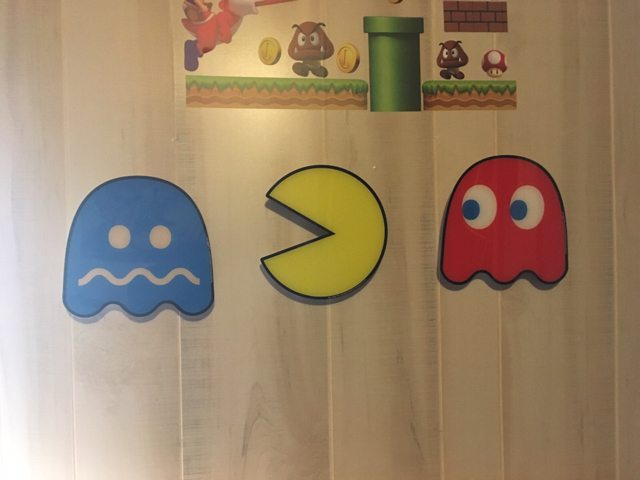 I saw these light up Pac Man character signs at WalMart and think they fit great with the Pac Man machine and will sit above it when I love it in. I also found another PacMan tin sign while I was out, and added it to the previous one. This also shows the switch I got years ago for the main room lights. Got more work done today. Also found a location selling The Rampage Arcade1Up setup for 150, I plan on driving out Thursday and picking it up. It has Joist on it, which is the first arcade game I ever played, and seems a good fit for the game room. 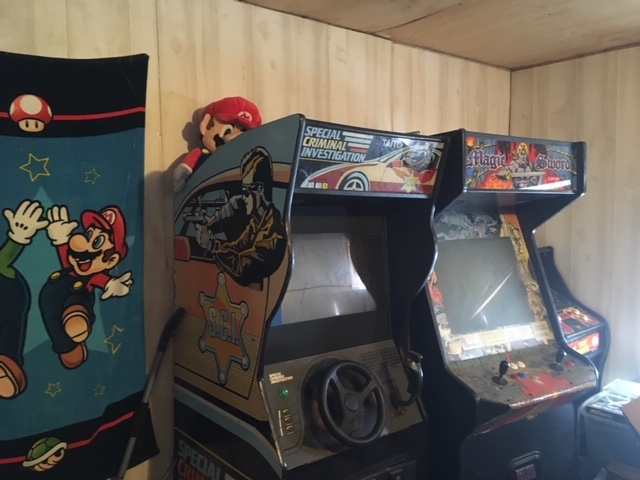 As of right now, the below photo is the arcade wall before I add 3 more of the Arcade1Up machines to it. I’ll likely add two more to the south wall and MAYBE a single one to the north wall if they do a third wave with others I really want. The flooring had some water damage along with the paneling thanks to a roof leak that went inside the wall. The entire house gets reroofed April, so at that point I’ll have to pull that out and redo it. Added Rampage, still need a riser but I couldn’t turn down 150 for it. This is a big one for me cause it has Joust, first arcade game I played. I plan on getting the 12 in 1 Atari machine at some point, as well as Final Fight and Mortal Kombat when they release. In other areas, the next step is getting book cases. I need 2 shorter ones and 1 or 2 taller ones. Those will hold all game carts I have, and a few extras like my mini Coleco cabs and other small gaming paraphernalia items. Also working on mounting the projector as soon as I get my screen for it in, and hanging paneling in a few new spots and building the TV stand and custom bookcases for the console area. So I was bad and just ordered a FOURTH Arcade1Up machine. I found Asteroids for 150 and almost bought it, but the Deluxe cab was also on sale for 100 off, includes a riser with all the games on the Asteroids cab, all the games in the Centipede cab, plus 4 extra. Seeing as how none of the cabs I got so far use a spinner or trackball, I ordered a Deluxe so I have some unique control methods in one of the cabs. Still waiting on Mortal Kombat and Final Fight to release so I can add them, than the arcade section will be completed. I’ve been mostly running the 19 in 1 on my Magic Sword cab, been addicted to Robotron for a while. Also have a couple of book cases to assemble for some of my cart games and books, beginning work on the south wall. This weekend I am re routing wiring from the water heater to the new front breaker box so I can run a fresh breaker and wiring for the PA audio in the room, which will handle audio for the projector and drum kit, and also hanging some paneling on the rear entrance doorway now that I have the outdoor light switch required with the new arcade button setup.